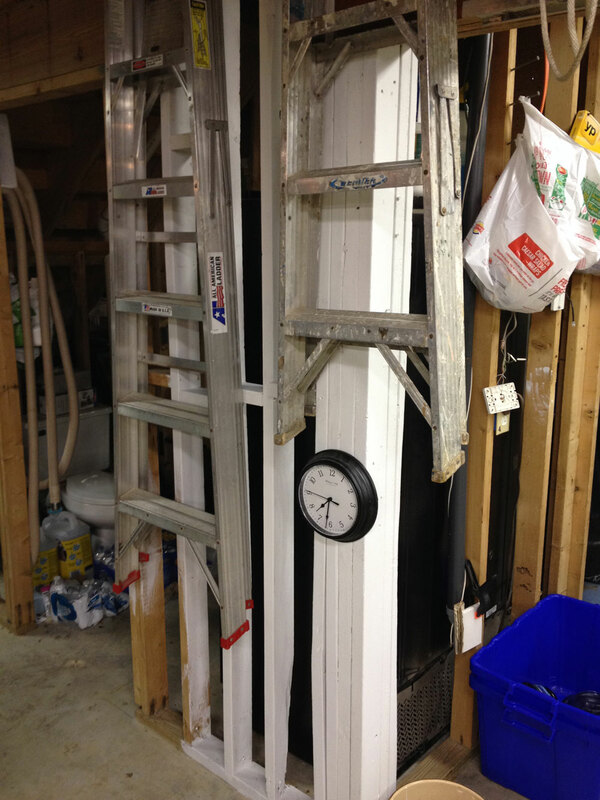 Good light reflection is supplied by white pegboard on all shop walls. 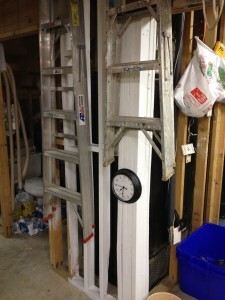 To make the most of the light fixtures installed, almost everything in my shop is white, or very light-colored. 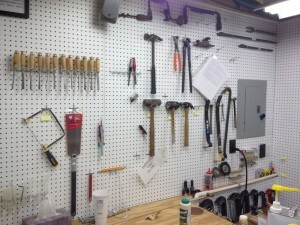 I purchased white pegboard, which cost more initially, but saved a ton of time and mess compared to painting natural, dark brown pegboard and dealing with the inevitable runs as paint drips from the peg holes. When we first moved to this home on the bayou, bass fishing was my number one hobby, and I never intended to get so heavy into woodworking and furniture-making, much less having virtual visitors in my shop. If I’d known, I might have put a white ceiling in before installing the lights. On the other hand, if I had covered the ceiling, I’d have lost all of this good storage space. Wooden tool cabinets are either painted white or finished in their natural, light wooden color. Even in areas where there is no wall-covering, I’ve lightened up the decor by painting natural-color studs with leftover white paint when working out brushes and rollers. Everything that can be a lighter color is painted or covered to maximize reflection of light. I’d encourage visitors to do some research on LED lighting. I recently took an online course in LED 101 and was shocked by what’s happening. First and foremost the technology is changing ….. FAST! The professor for this course, from the Univ of Kentucky, says it’s changing just as fast as smartphones are. That means new technology every MONTH. His course was put together in Oct 2014 so there’s lots new since then. 1) It gets cheaper to buy by the week. Lots cheaper. Since 2010 it’s down by 90% on average and still going lower. 2) The electricity usage is getting less and less and less. Some are as low as 3W (too cheap to meter?) This creates less draw on your service panel and leaves more for the BIG tools, eh? 3) There are plenty of “temperatures” to choose from now (warm, daylight, etc.). 4) The stuff now comes in strips that can be run anywhere. Anywhere. Across walls at angles, for instance. In patterns for aesthetic joy and art. 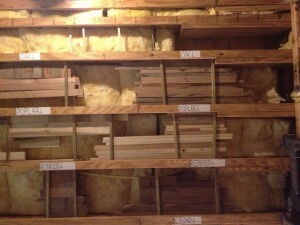 One pic showed two strips — each 3/4″ wide — right in the corner of 2 walls, vertically, ceiling to floor. The possibilities are endless. And colors and all dimmable …. the list goes on. We’re on the verge of major changes to lighting in the office, home and shop. The savings in electrical usage esp. against those juice-drinking halogens, can offset their cost (most likely you can’t afford NOT to do it). And the expected life of these light strips is in the 50,000 hour range. (You should know that LED’s don’t burn out — they slowly reduce the lumen output. 50,000 hours is when they’ve lost 30% of their original power.) Check it out online. Nice article; its easy to overlook the obvious until your eyes age a bit. Just a couple of things to add here. I used OSB for roof sheathing and made sure to buy foil-faced. At just an extra $1 per sheet it gives me a finished overhead surface that’s highly reflective. I used the other side toward the sky but covered it first with tar paper then double bubble foil. I left the required air space between the foil and the metal roof by stripping with 2x6s that were ripped in half (2×3) and used a galvalume roof. This radiant barrier really works. OK, so I technically have three radiant barriers, but for so little R-value, the building stays cool. There’s one layer on the walls too, it’s the double bubble foil. I keep an 800 sq ft shop cool with one 8000 btu window unit in the Louisiana heat and a small fan. I wanted all my stud cavities exposed to the inner shop where I am making use of the 5-1/2″ deep spaces for various storage. As Jim did, I painted everything inside white, including all the framing before putting it up. I was trying to protect it some while working alone at a one careful man pace. Great tips, Dennis. Thanks for reading, Jim. RiverRat, Steve Johnson wrote on this topic, his own little “LED 101”, and clicking on that link will take you to his followup column, in which you can find a link to the original post. You are exactly right! LED technology is changing fast enough to make one’s head spin. Thanks for your enlightening report, and thanks for reading, Jim.